Sequencing or Array Testing for Genetic Diseases? When a child is born with a suspected genetic condition, an increasing number of tools are available to the clinician: newborn screening panels, metabolic testing, cytogenetic testing, gene panels for certain conditions… and more recently, comprehensive sequencing of the exome (i.e. all protein-coding genes) or the genome. Yet chromosomal microarray (CMA) is often the frontline diagnostic tool. Diagnoses (or excludes) many prevalent genetic conditions such as Down syndrome, 22q (deletion) syndrome, Smith-Magenis syndrome, etc. Many clinical testing labs actually require that microarray testing to have been performed (when appropriate) prior to exome sequencing. There’s sound reasoning behind this: large-scale chromosomal aberrations should generally be ruled out before one goes looking for small variants that might cause syndromic changes. Will Sequencing Supplant Arrays for Testing? As the cost and turnaround time of sequencing-based tests improve, there’s a growing interest in ordering these tests either in parallel or instead of chromosomal microarray. Some of that interest comes from Illumina, whose representatives have been touting whole-genome sequencing as the “one test to rule them all” for the diagnosis of rare disorders. Of course, Illumina has a monopoly on the next-gen sequencing market, so they have financial incentives for encouraging the switch to sequencing-based tests. One requirement, if we move in that direction, is a solid understanding of the diagnostic and clinical utility of each test. In other words, it’s useful to know how often array, exome, or genome sequencing tests provide a molecular diagnosis (diagnostic utility) and whether or not that changes patient care (clinical utility). A study published this month in NPJ Genomic Medicine examines the diagnostic success and clinical utility of whole genome sequencing (WGS), whole exome sequencing (WES), and chromosomal microarray (CMA) over the past five years (see the nice summary on GenomeWeb). Michelle Clark et al looked at 37 studies (published from 2013 to 2017) describing a total of 20,068 patients who underwent genetic testing by WGS, WES, and/or CMA. 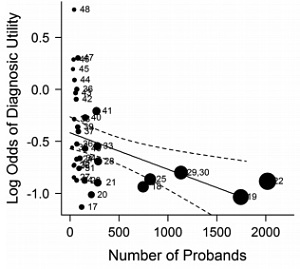 The studies ranged in size from 22 to 1,745 probands, and the number was modestly correlated with diagnostic success: on average, an increase of 1,000 probands decreased diagnostic utility by 28% (see right). So large studies tend to have a lower diagnostic rate, but I should point out that there are a number of factors at play here. One obvious consideration is that it’s easier to perform deeper analysis/interpretation on a small cohort than a large one. Another is that only a subset of laboratories have the capacity to test thousands of samples. More on that in a minute. Despite the lower-than-hospital diagnostic utility, reference laboratory publications are important for a number of reasons. First, they were large studies that helped set expectations in the medical and research communities about the expected “yield” of clinical WES. In essence, they’re the basis of the widely-accepted figure that exome sequencing provides an answer in about 1/3 of cases. Second, their underlying metrics provided guidance for groups who carried out their own sequencing and interpretation. For example, they highlighted the major contribution of de novo mutations, which account for ~45-50% of successful diagnoses. Third, these studies served as a form of accreditation for major commercial providers of clinical WES. It’s well known among sequencing laboratories that there’s a higher chance of success when testing a trio (proband and both parents) than a proband alone (singleton). Trios provide valuable information, such as the origin of a variant, that factor into interpretation. The meta-analysis by Clark et al has put some numbers behind it: Across five studies totaling 3,613 children, the diagnostic rate for trios was double the diagnostic rate of singletons. This supports the notion that, when possible, a full trio should be used for genetic testing. Some laboratories accomplish this by sequencing the proband and then testing parents for a limited number of promising variants. Other labs, like ours, prefer to sequence all three samples right off the bat. It’s good that we can quantify the benefit of testing a full family trio. That being said, we have to recognize that this will not always be possible in our modern world. Some children won’t have both biological parents around, available, and willing to participate in genetic testing. That’s just a fact, and we have to do our best to serve them even in non-ideal testing conditions. Now we come to the meat of it: comparing diagnostic and clinical utility between WES, WGS, and microarray. Only two studies compared the diagnostic rate between WES and WGS, and it was not significantly different. Thus, WES and WGS together were compared to microarray. On average across 28 studies totaling 10,392 probands, the diagnostic rate by WES/WGS was 31%. On average across 13 studies totaling 11,429 probands, the diagnostic rate by array was 11%. That’s the main answer, but we can dig deeper using studies of children that received both WES/WGS and array testing. There were four such studies that provided sufficient information to calculate the odds ratios, which revealed that the odds of a diagnosis by WGS/WES was 8.3 times greater than array. 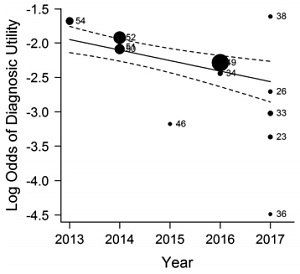 The authors also noticed a interesting trend over the five years of their meta-analysis: the odds of diagnosis increased 16% each year for WES/WGS but decreased 14% each year for array. They point out that the former is probably due to the maturation of sequencing-based tests over time. The latter, however, is initially surprising since array testing was already fairly mature in 2013. It turns out that the decrease in array diagnostic utility is probably due to reimbursement. Once it started being routinely reimbursed by insurance, array testing got ordered much more often and the diagnostic utility decreased as a result. I expect we might see a similar effect as WES becomes the frequent go-to for clinicians. It isn’t necessarily a bad thing to have WES accepted and reimbursed as a frontline diagnostic tool, but we should be prepared to explain such possible outcomes. Last we come to the vital question of clinical utility, i.e. whether a patient’s management is changed based on the results of molecular testing. Here there were differences between sequencing strategies: clinical utility was significantly higher for WGS (0.27) than for WES (0.17). Yet both of them had substantially better clinical utility than array (0.06). Under current guidelines, chromosomal microarray testing is the first-line genomic test for children with intellectual disability, developmental delay, autism spectrum disorder, and congenital anomalies. There are no guidelines yet established for WES/WGS testing. It may be time for that to change. The views expressed on this site do not reflect the opinions of Nationwide Children’s Hospital or The Ohio State University.